What began two years ago with the introduction of a couple charging stations for Lime bikes that you could rent on the go with one simple application on your phone has transformed public transportation in San Diego into an electric scooter monopoly, with Lime, Bird, Razor, Jump and Lyft scooters of all colors and styles scattered in every street corner. To think that when these electric scooters were initially introduced, it was as a solution to the short-term commute problem that we were experiencing in San Diego, now because of their convenience and accessibility it seems they have become the preferred mode of transportation. In downtown people ride them to work, tourist ride them to go sightseeing, college students ride them at the beach, and locals ride them around town when they go out. The problem with this new freely available scooter rental service is that there is no effective oversight of the use of the electric scooters; anyone who is at least 18 years old with a drivers’ license or permit, a credit card and a smart phone can simply download the application, scan the electric scooter they want to activate, hop on and hit the throttle. Service providers are not there to verify that the person who signed the electronic user agreement is actually the person who will be riding the electric scooter or that the operator is complying with the terms of service; the company’s only concern is that the person who signed the agreement has assumed legal responsibility thereby releasing them of liability. This lack of oversight is very serious considering the dangerous nature of the activity; people of all ages with no required prior experience and limited instruction provided, riding an electric scooter that can travel up to 20 miles per hour with breaks as the single safety feature, sharing the road with vehicles and pedestrians alike. With no one to monitor the situation, clearly accidents are bound to happen and because of the electric scooter’s limited structural capacity and lack of safety features, when they do occur injuries are inevitable. The physical structure of these electric scooters consists of two small wheels, a motor, a floorboard with a kickstand, a short wheel base, and a handlebar with a throttle and a brake lever. The motor that powers these electric scooters allow them to travel up to fifteen to twenty miles per hour, but the short wheel base design makes them very unstable to ride alongside other vehicles traveling on the road at the same speed. In an event of an accident, the narrow floorboard is the only physical barrier that exists between the operator of the electric scooter and the rest of the road, this means that there is no protection from sudden changes in weather, road or traffic conditions. This complete and constant exposure of the operator of an electric scooter coupled with the fact that the brakes are the only safety feature available in the current models has resulted in a rise of serious injuries in San Diego from accidents between electric scooters and the pedestrians and motorists that they share the road with. If you or someone you know has been involved in an accident with an electric scooter it is very important that you contact a personal injury attorney immediately to assess your claim. Given the novelty of these cases, the law on electric scooters is constantly being decided, will be challenged and amended. At San Diego Injury Law Office our knowledgeable electric scooter accident lawyers are here to review your case and provide you with the most updated legal information to establish your personal injury claim. Contact our experienced San Diego electric scooter accident attorneys at (619) 343-2992 to receive your FREE consultation today! In an effort to deal with the oversight problem, the state legislature of California has stepped in to regulate the operation of these electric scooters by subjecting them to the same traffic and safety laws as any other vehicle on the road. This means that you can now be ticketed for any failure to comply with the California Vehicle Code while operating an electric scooter. It is important to point out however, that electric scooter operators do not require a special driver’s license to ride them and they do not have to be registered with the DMV. California Vehicle Code section 407.5 defines an electric scooter as any two wheeled-device powered by an electric motor that has handlebars and a floorboard designed to stand up while being driven. Given the recent spike in electric scooter accidents in California, the state legislature has also enacted additional electric scooter specific safety regulations that operators will be subject to pursuant to the California Vehicle Code. If you have been injured in an electric scooter accident you need an attorney who is up to date on the changing legislation regarding these cases. At San Diego Injury Law Office our team of legal experts are here to explain to you the latest electric scooter traffic and safety laws. On January 1st legislation was just passed by state governor Jerry Brown making safety helmets optional for adults when riding an electric scooter on a street with a maximum speed limit of 35 miles per hour. However, safety helmets continue to be mandatory for operators under the age of 18 at all times. Also, establishing the speed limit to ride electric scooters at 15 miles per hour on roads with a speed limit of 25 miles per hour. Keep in mind that electric scooters are not allowed to be driven on roads with a speed limit greater than 25 miles per hour unless there is a bike lane assigned, then you must stay within the bike lane. Pursuant to California Vehicle Code Section 21235 operators of electric scooters are required to at least have a valid driver’s permit, not operate a scooter with other passengers onboard, not attach to another vehicle on the road, and not carry packages that will prevent the operator from keeping at least one hand on the handlebars. When operating electric scooters at night, California Vehicle Code Section 21223 requires that electric scooters have a front light that can be seen from the front and the sides and reflectors that can be seen from the rear and the sides. Lastly, when it comes to sidewalks, California Vehicle Code section 21235 states that operators of electric scooters are not allowed to ride on the sidewalks, leave the scooter lying on its side on the sidewalk or park it in a way that creates a hazard for pedestrian traffic. Clearly by the look of our streets this specific regulation is not being strictly enforced as electric scooters continue piling up on the sidewalks. The reason behind this is because the operators of these electric scooters have realized that in effect there is little to no oversight regarding the parking of the scooters so they are careless leaving them lying around wherever is most convenient to them. The problem with this is that in addition to being a real eye sore to look at, the clutter of electric scooters on sidewalks are endangering pedestrians who end up tripping over them and falling down, injuring themselves as they try to walk by. Similarly, electric scooter operators are endangering pedestrians by riding the scooters on the sidewalks instead of on the road where they are supposed to be ridden. The reason behind this is that the compact size of these electric scooters makes them less visible on the road, leaving them vulnerable to a collision with a vehicle so operators feel safer riding on sidewalks than alongside other vehicles on the road. The problem is that in an effort to protect themselves from a collision with a vehicle driving 25 miles per hour, these electric scooter operators are exposing pedestrians to being ran into by an electric scooter traveling at 15 miles per hour. Not to mention the newest the trend that has developed of sharing electric scooters, whereby two people attempt to stand on an already narrow floor board and maintain stability on a short wheel base while traveling 15 miles per hour on the road on an electric scooter that is meant to be operated by a single person with a weight limit of 200 pounds. Injuries have not only multiplied but intensified in severity from the time electric scooters were first introduced to San Diego in September of last year. What began as a couple bruises, scrapes and cuts here and there, quickly turned into simple wrist sprains, twisted ankles, mild concussions and has recently developed into shattered ribs, collapsed lungs, ruptured spleens, broken collarbones, and head fractures. Yet every week we seem to receive a new shipment of electric scooters in the city, introducing more electric scooters to an already saturated market as new service providers appear overnight. With no effective solution to the oversight problem with these electric scooters, operators will simply continue placing their safety at risk and endangering nonriders along the way. At San Diego Injury Law Office we believe that it is our responsibility as a respected plaintiff’s firm in our small San Diego legal community to stand up to these big companies and hold all negligent operators accountable for the unnecessary risks that they take by getting on these electric scooters without any regard for the potential victims around them and the laws that are supposed to protect them from harm. If you or a loved one has been injured in an electric scooter accident, you are not alone, we are here to pursue the full extent of your personal injury claim and representing only your interests every step of the way! Give us a call at (619) 343-2992 for your FREE consultation today so that we may discuss the best route to obtain the fair compensation that you deserve for your injury! In addition to understanding the state laws mandating the safe operation of electric scooters you will also need a personal injury attorney who is well versed in contract law to determine the liability that has been drawn out in the service provider’s electronic user agreement. As a precaution, we always advise anyone getting on one of these electric scooters to first read the terms of service to understand the extent of the responsibilities as an operator and the company’s limited liability as the transportation service provider. However, the reality is that most people fail to read the electronic user agreement that is required to be signed prior to downloading the service provider’s application on their phone. This is because people forget that every time that they log onto the application to lease an electric scooter, they are actually entering into a legal contractual obligation with the service provider. 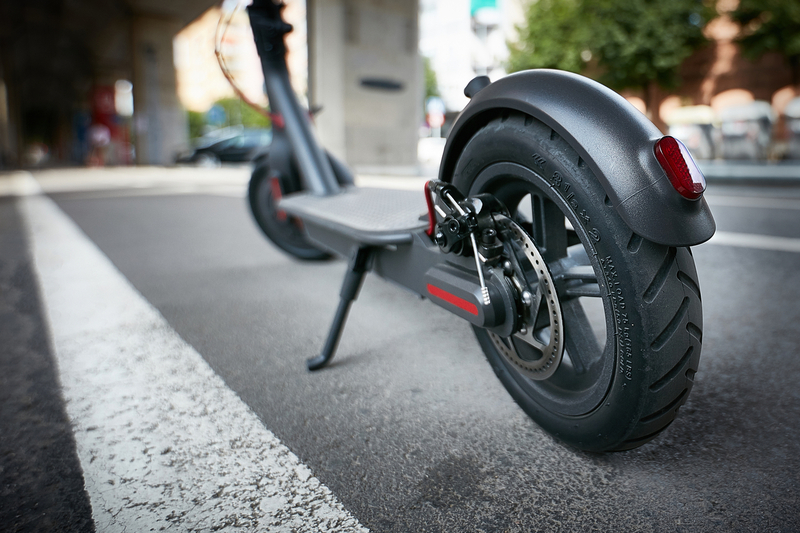 When you provide your digital signature, this represents your understanding of the condition of the lease and agreement to abide by its terms, in other words by signing you are accepting to be held accountable for your obligations as an operator of the electric scooter you are renting. The service providers tend to make their electronic user agreements very lengthy because their lawyers know that very few people actually take the time to read thru them. If they did, they would realize that the company’s lawyers have carefully worded the user agreement to avoid liability and protect the service provider in the event of an accident. For example, to release liability the user agreement typically includes an acknowledgement by the user that he or she is familiar with the operation of, is aware of the risks associated with and must provide driver’s license information to ensure that the user is legally permitted to operate an electric scooter. Also, in an effort to minimize litigation in the event of a dispute, the service provider’s agreement will generally include an arbitration clause requiring the user to forego their right to sue the service provider and join in any form of class action suits that may arise against the service provider. Lastly, the service providers’ lawyers will usually include in fine print broad safety instructions for performing inspections of the equipment before riding and how to operate the electric scooters. For example, check to see that the breaks are working, there is enough battery left on the scooter, you do not exceed weight limits, you do not ride on private property. Of course, users are usually in such a rush to download the application and ride the electric scooter that they blindly consent to the user agreement without even knowing what it is that they will be liable for in the event of an accident. Then when an accident does occur, the operator’s lack of understanding of the agreement leaves the victim of an electric scooter accident with uncertainty as to who should be held accountable for the injuries they suffered. We understand that in these circumstances it is difficult to for you to determine who is responsible because there are many different parties involved, the rider, the service provider, other motorist and pedestrians on the road, each with their own agenda to avoid liability. That is why you need a skilled electric scooter accident lawyer who knows exactly what to look for in the user agreement between the operator and the service provider to determine the liability of each party. At San Diego Injury Law Office, we are here to help you determine from whom you may legally recover damages from for your injuries and will make sure to hold each party accountable for their part in the electric scooter accident to obtain maximum compensation for the harm you suffered at their hands! Like in any other accident, who will be held accountable in the event of an electric scooter crash will depend on the cause of the accident, which party was at fault. If the accident is the result of the operator negligently riding the electric scooter, then liability will remain with the operator. Examples of negligence by the operator of an electric scooter would include riding while intoxicated, riding on the sidewalks, and riding with a passenger onboard. Similarly, if the accident is the result of the driver negligently driving the vehicle, then liability will remain with the driver. Examples of negligence by the driver of the vehicle would include texting while driving, speeding, and cutting off the bike lane. Lastly, if it turns out that the accident was the result of the pedestrian’s negligence, then liability will remain with the pedestrian. Examples of pedestrian’s negligence would include failing to stop at a designated crosswalk, jaywalking between parked cars, and walking along the highway. But what happens when more than one party is liable for the same accident? California is a joint and severally liable state which means that when there are multiple tortfeasors, they will be held jointly and severally liable for the total economic damages and severally liable for those noneconomic damages suffered as a result of the accident. Joint and severally liable means that a personal injury victim can pursue liability against any one defendant regardless of their individual share of liability and the defendants are responsible for sorting out their proportions. Upon successfully establishing liability, you will be able to collect all economic damages from any one of the defendants, these are your past and future medical bills, loss of past and future wages, costs of repair or replacement costs to your property damage. You could also collect noneconomic damages proportionately from each defendant for your pain and suffering, loss of consortium, and the emotional distress that you underwent. For example, if you were injured in a car accident that was caused by one vehicle trying to avoid hitting an electric scooter that was being operated on the wrong side of the road, then we could go after the driver of the vehicle that struck you, the operator of the electric scooter that was a hazard on the road and if the reason the electric scooter was being ridden on the wrong side of the road was because of a malfunction, then potentially we could also try to seek damages for your injury from the service provider. However, when it comes to any type of liability in electric scooter accidents it is crucial to point out that in California only vehicles are required to carry a minimum liability insurance, which means that unless the operator of the electric scooter opted in for it, we are limited to seeking damages for your injury from the operator’s home owner’s or renter’s insurance. Similarly, for the service provider if we are able to establish that the scooter malfunction resulted from the company’s negligent maintenance of its electric scooters then we could seek damages for your injury from the company’s business insurance. In order to seek damages from all three parties and their respective type of insurance policies, we have to determine liability for each defendant separately. In other words, we have to prove that the driver directly injured you when the vehicle struck you, that the operator indirectly injured you when it became a hazard on the road causing the vehicle to strike you, and that the service provider indirectly injured you when it failed to maintain its electric scooter in a safe condition to be ridden by its customers. Generally, in these cases we find that there has been a release of liability made on the part of the service provider thru language in the user agreement requiring that the operator perform an inspection prior to riding the electric scooter in order to ensure its safe operation and releasing the company from any liability for failure to do so. As you can imagine these user agreements make it very difficult to hold service providers accountable because they rely on the user’s signature to deny any and all legal liability. That is why you need a skilled personal injury attorney that is knowledgeable in contract law and specializes in electric scooter accidents to stand up to these big company lawyers and hold their clients accountable. At San Diego Injury Law Office, our legal team is made up of private investigators who will visit the scene of the accident to determine the cause of the malfunction and our electric scooter specialists will use these findings to determine if the specific malfunction that occurred was something that would have been noticeable in a general walk thru inspection that was required to be performed by the operator prior to riding the electric scooter pursuant to the user agreement. If it turns out that the malfunction was not noticeable then our contract lawyers and personal injury lawyers will work together to try hold the service provider accountable by establishing that they were the only ones that could have done something about the scooter malfunction that resulted in your injury. Together we will put all of our resources at your disposal to make sure that we hold every single party accountable for your injury. For a FREE consultation, give us a call today at (619) 343-2992, members of our experienced legal team is standing by!